We wouldn’t let a terrible weather forecast stop us! 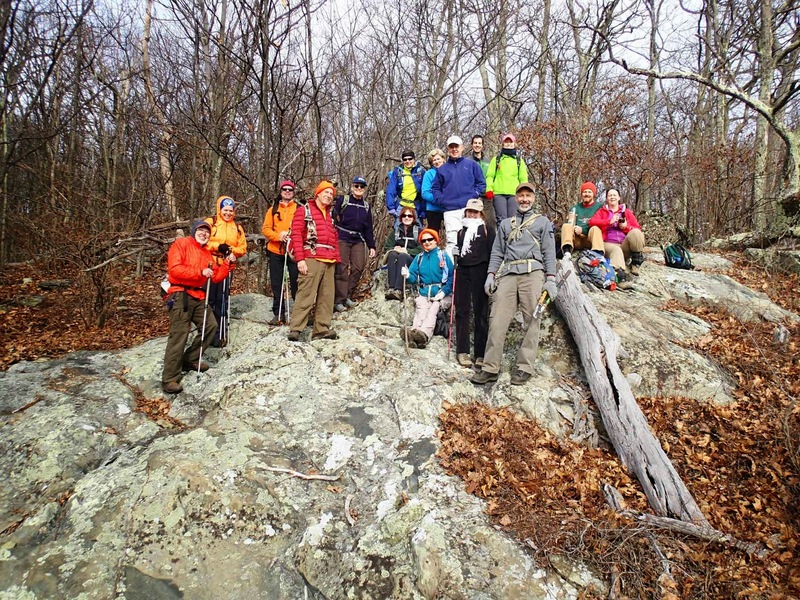 So despite the threat of rain and 36 degrees, following a day of heavy rain, our group assembled anyway to travel a short distance north of White Hall to hike the historic Brown’s Gap Turnpike. Our initial group: Anne Colgate, Sunny Choi, Leon Gorman, John Brandt, Lisa Lampe and Max the dog, Brian Muszynski, Susanna Williams, Christine Brennan, Andy Willgruber, Briana Taylor joined into carpools with Bill and Iva and headed west. At the Piedmont Store in White Hall, we added three horse women to our group: Lynne Taylor, Nancy Handley, Stephanie Guerlain and the infamous Michael Seth, who joined us from Harrisonburg. 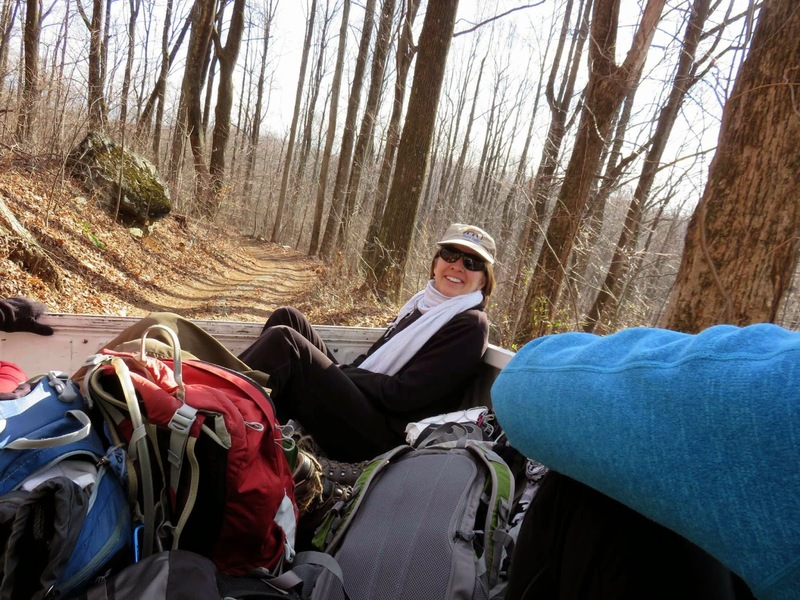 Upon reaching the trailhead, we were joined by Barbara Dudley. A GREAT GROUP! 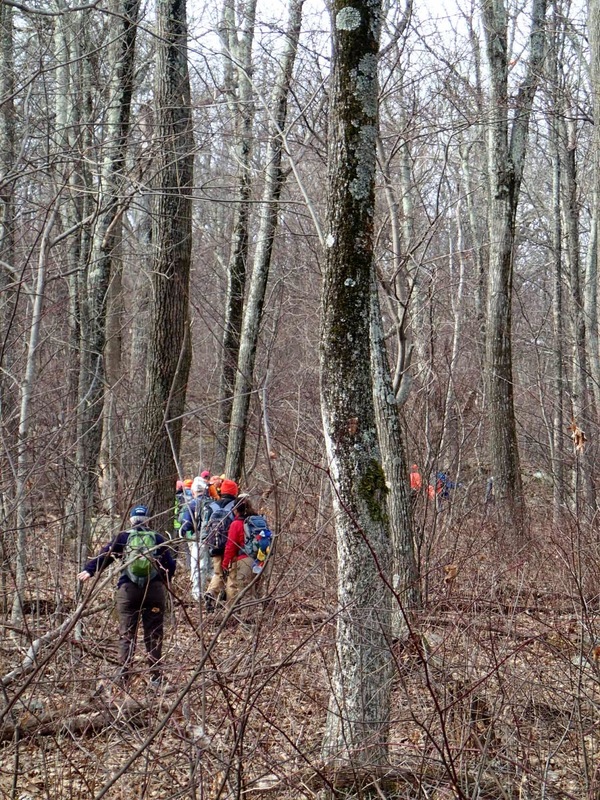 We spread out as we began the steady climb up the road, wooded on both sides. It was great to see Briana again, after a semester of intense teaching and Susanna after her recent travels. We talked about holiday trips, recent illnesses, and winter weather. While it was damp on the ascent, the climb was steady, and winding. This roadbed was used by Stonewall Jackson during his Valley campaign in 1862, on his way to the Battle of McDowell. There are several historical buildings still in Brown’s Cove, including the former residence of Brightberry Brown. 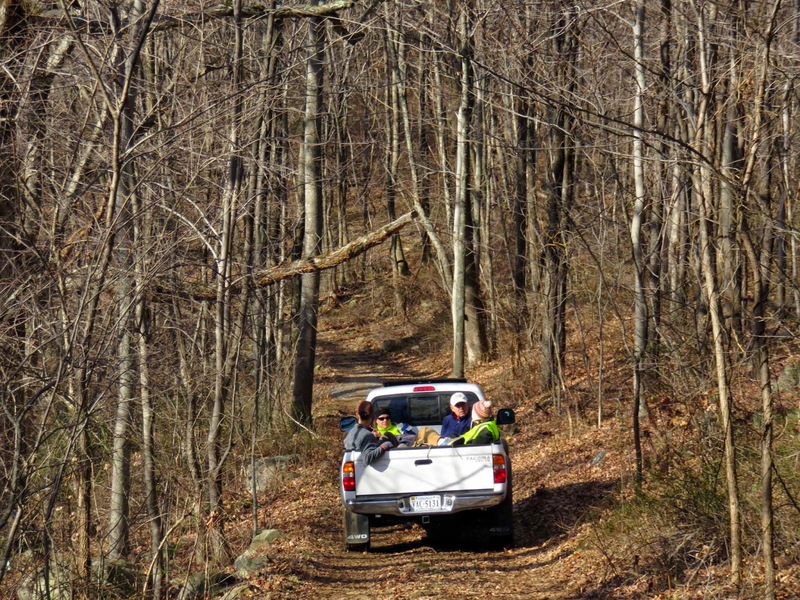 Brown completed this Turnpike with William Jarman in 1805 connecting the Doyle River area with the Shenandoah Valley and other trails to the west toward Hardy Co, W.Va. It has been a public road since 1867, and two miles from the parking lot, it ends in the SNP on a fire road that leads to the Doyle River Trail. This is where the 4 mile hikers decided to turn around. As we reconvened at the park boundary, we enjoyed homemade brownies and hot chocolate. 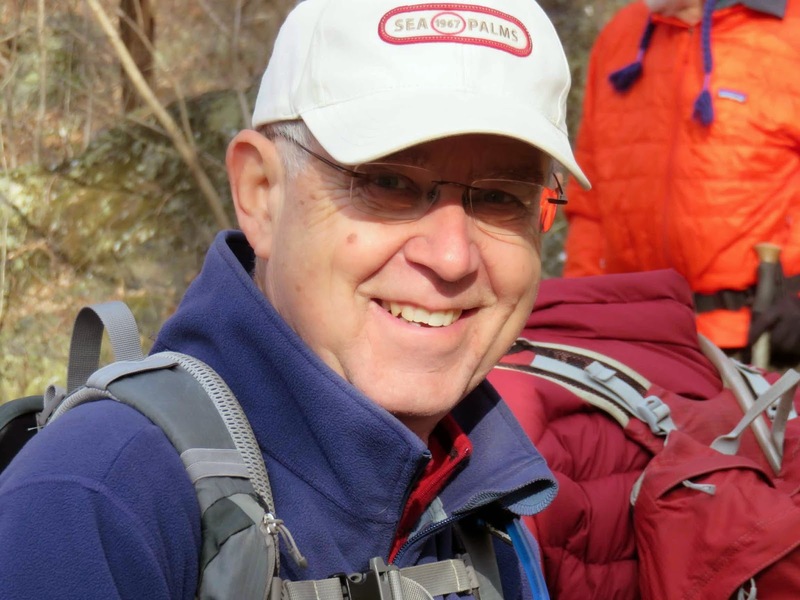 Since the rain began, our group divided, and the short hikers returned back to their cars with Bill. 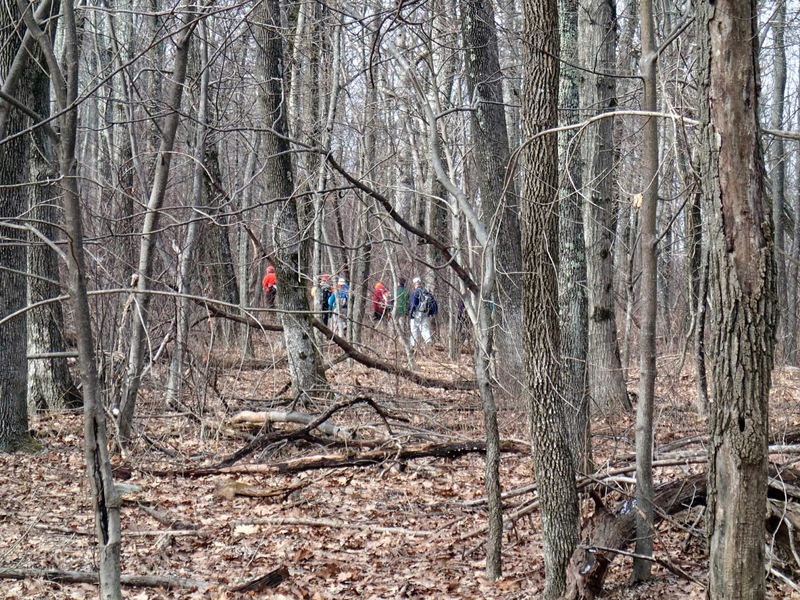 The “Hardy Hikers”- Leon, Anne, Sunny, Brian, John, Christine, Susanna, and Michael continued on with Iva for another 2 miles until we joined the Doyle River Trail. 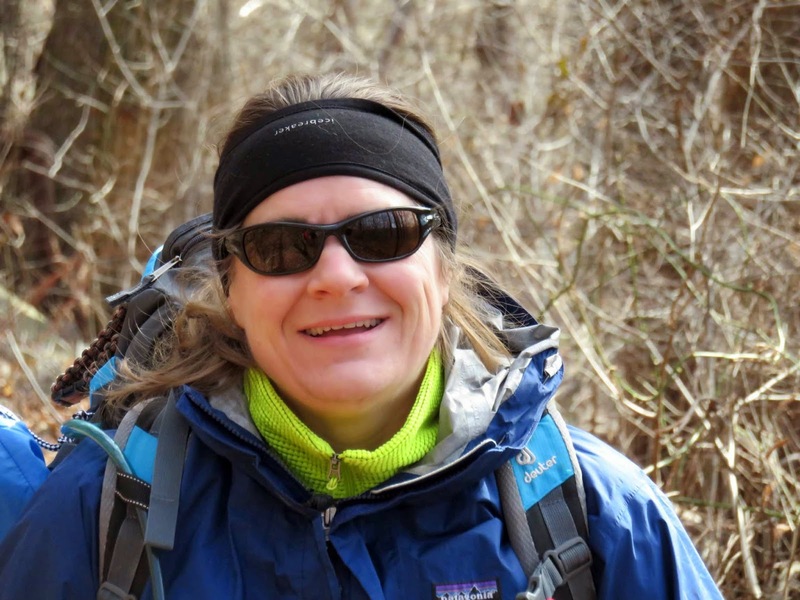 The weather conditions improved, making the hike lovelier, with ice forming on the trees first, and then snow blanketing the ground by the time we reached the trail intersection. We descended toward the Upper Falls where we enjoyed lunch beside the Doyle River. After a brief lunch, we returned the same way, making a stop to see an old moonshine mash container big enough that Brian could stand inside it! We were disappointed to see the snow fading away as we descended the turnpike, but we were greeted with a sunny day when we reached the cars at 2 PM, completing the full spectrum of weather for the day. It was a beautiful day for a winter hike; cold, crisp and sunny. 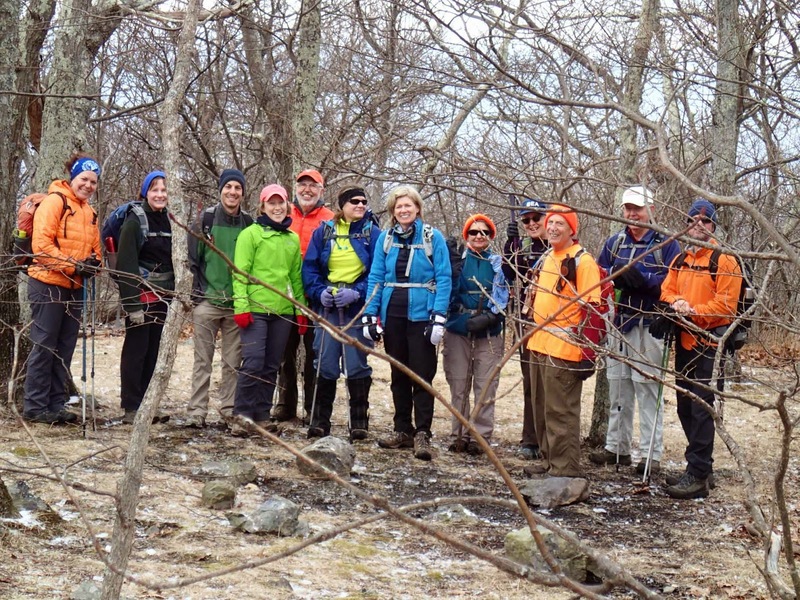 We had 10 hikers enjoy a slow hike on the icy trail. 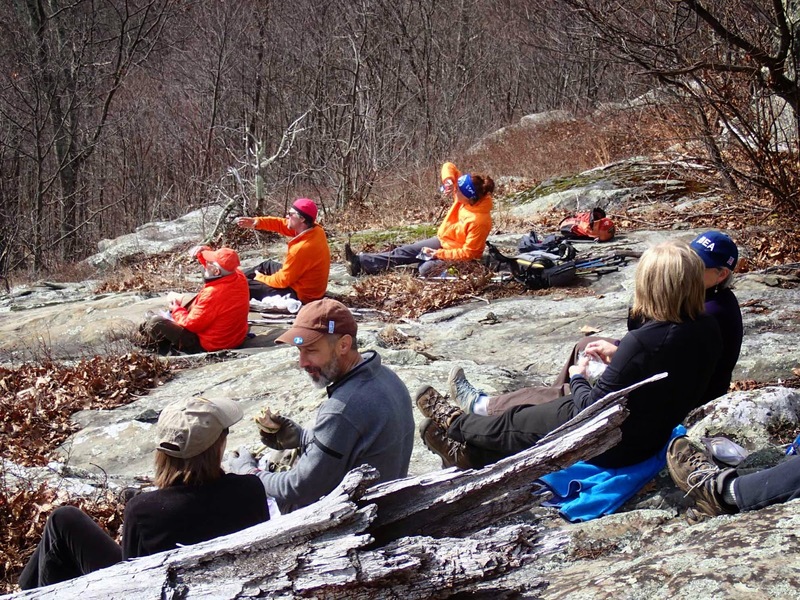 We started at Afton with the intention of hiking to Bear Den Mountain but with the distance and icy trail we decided to make lunch and the turnaround spot at Scott Mountain. The parkway was closed for the day and the very steep downhill to McCormick Gap would have been a little treacherous as it was ice covered. Nine of us started out at AHS; Dan Ralston (the leader), Jeanne Densmore, Katherine Maus, Marc Veuhoff, John Shannon, Lee Wenzlew, Leon Gorman, John Brandt and Susanna Williams. 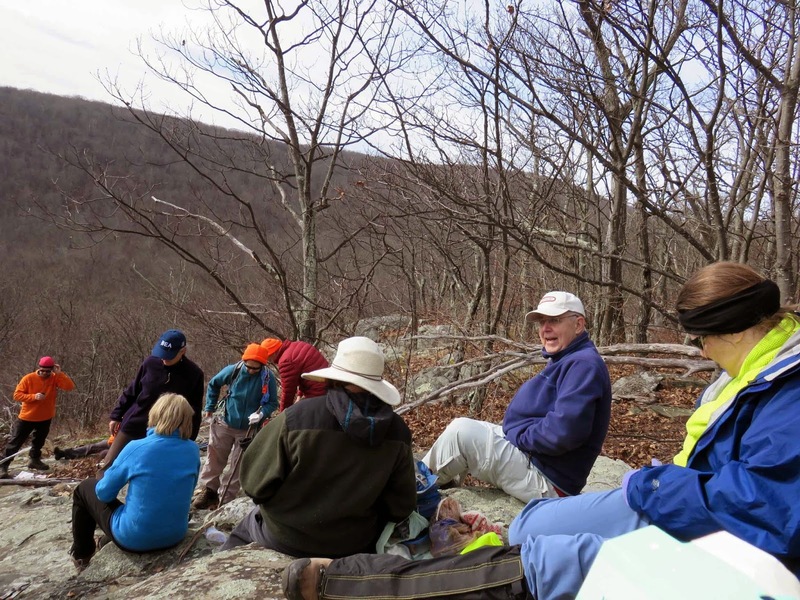 At Afton we united with Mike Smith and began the hike. 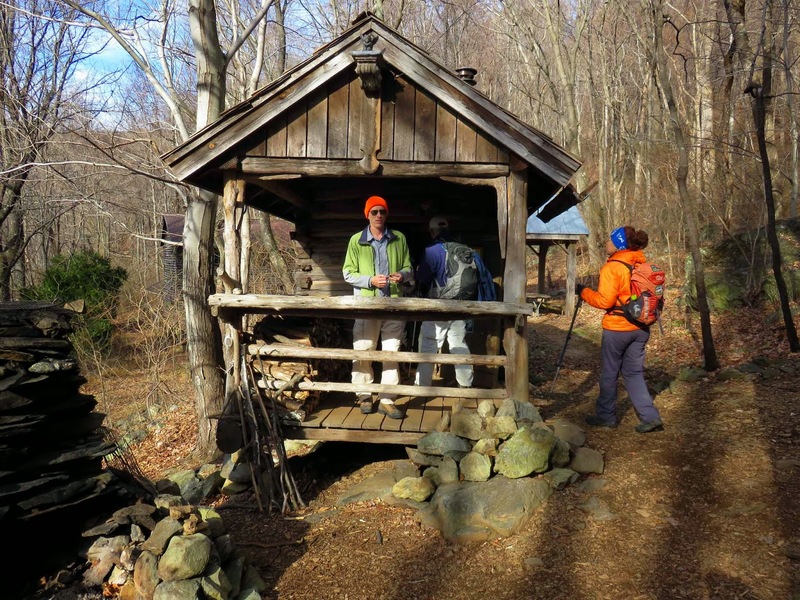 It was 16 degrees when we met at Albemarle High School, but that did not stop fourteen hikers and one dog from heading out to Rockfish Gap for an out and back 7 mile hike on the Appalachian Trail south towards the cabin ruins (and Paul C. Wolf Shelter for a few of the clan). 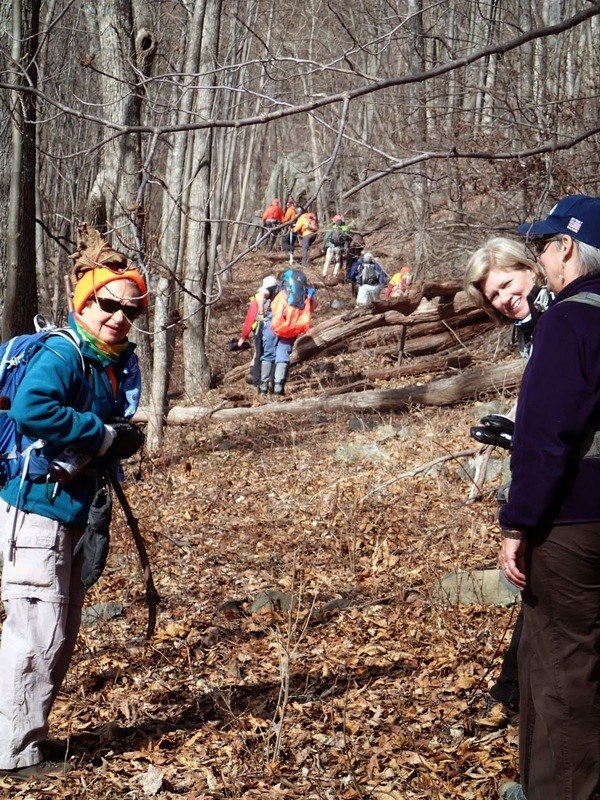 Hike leader Marit Anderson was joined by Leon Gorman, Tia Scott, Sunny Choi, Brian Muszynski, Jeanne Densmore, Dan Ralston, Iva Gillet and Remi the pooch from Charlottesville. At Afton we united with Scott Martin, CJ Woodburn, Anne Colgate, Dave Borszich, and David Crowe. Temperatures rose to 21 degrees and once we started hiking fingers and toes warmed up. The fairly moderate elevation change of 960 feet was suitable for all. There were a few small icy stream crossings, but overall the going was steady. At the ruins we stopped for snacks of chubby chews, dark chocolate, warm and cold drinks, and bites of our lunches. 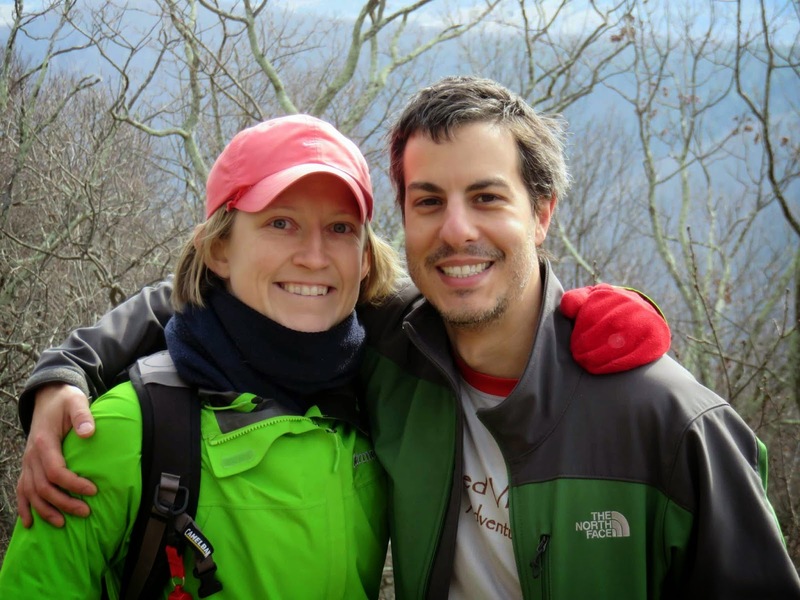 Anne and Dave continued on to Paul C. Wolfe Shelter making it a 10 mile trek, but the rest of the group headed back to the starting point at Rockfish Gap. Tia was proud of her first hike going 7 miles - and strong. Remi was happy too! After our active morning a contingent of the group went to Afton Winery to finish our lunches and partake in the delicious wines. It was a fine way to spend a cold, winter day. 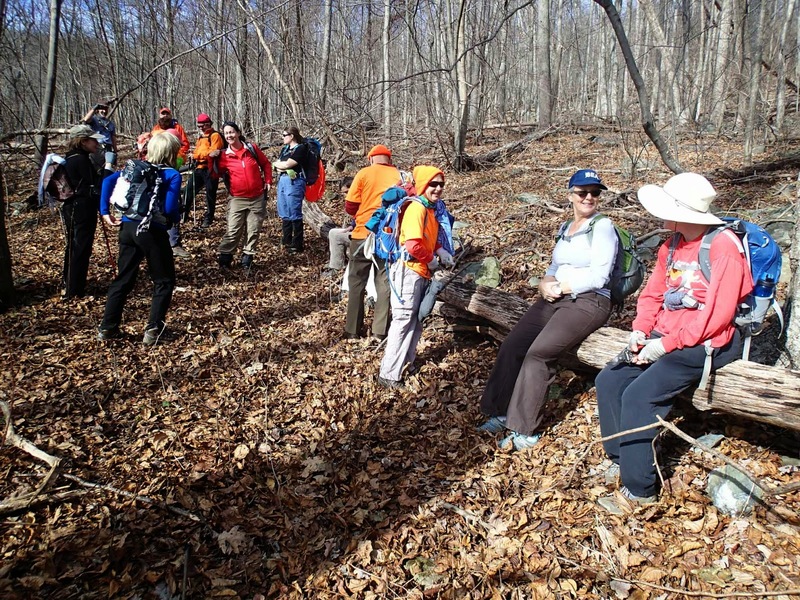 The Charlottesville Chapter’s post-Christmas Saturday hike was short on participants but long on variety. 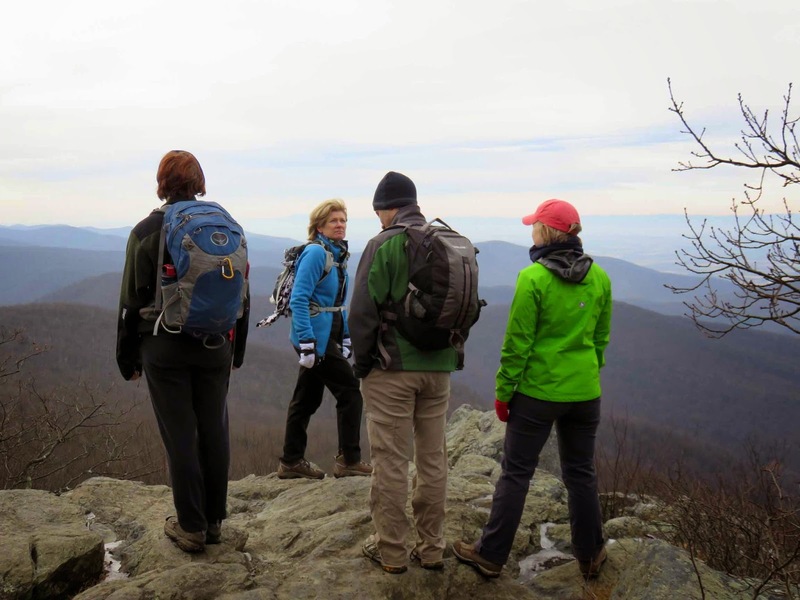 Four hikers met up in Charlottesville: Karen Ramsey, Marian Styles, Emily Berry, first timer Shawn Schubert, and hike leader Jeff Monroe. 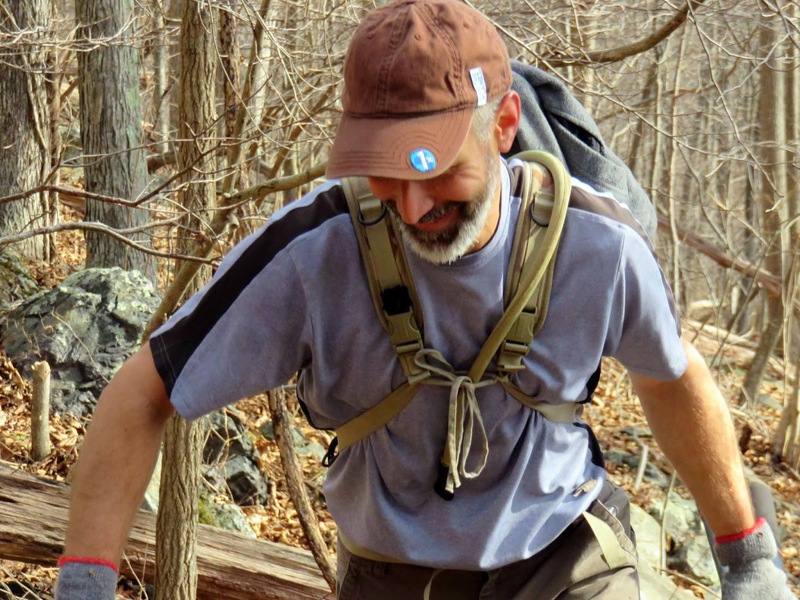 The group then met up at the trailhead with Michael Seth, who somehow managed to shoehorn the event in between trips to Nicaragua and New York – as he apparently works his way across the globe alphabetically. 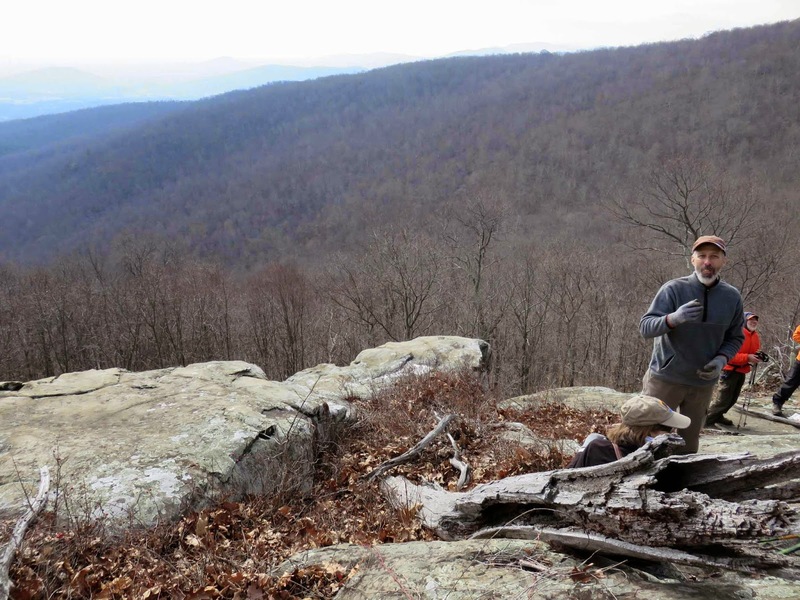 The last chapter hike of the year took the Appalachian Trail south over the James River Foot Bridge and into the James River Face Wilderness. 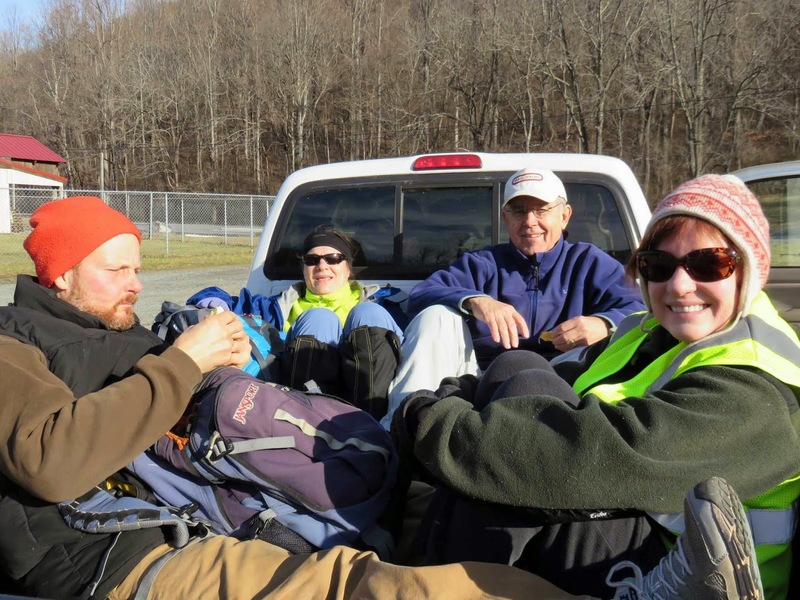 The crew took a break and group photo at the Matts Creek Shelter before retracing their steps as far as the Matt’s Creek Trail – also known as the high water trail for the A.T., an alternate route when the James River floods. 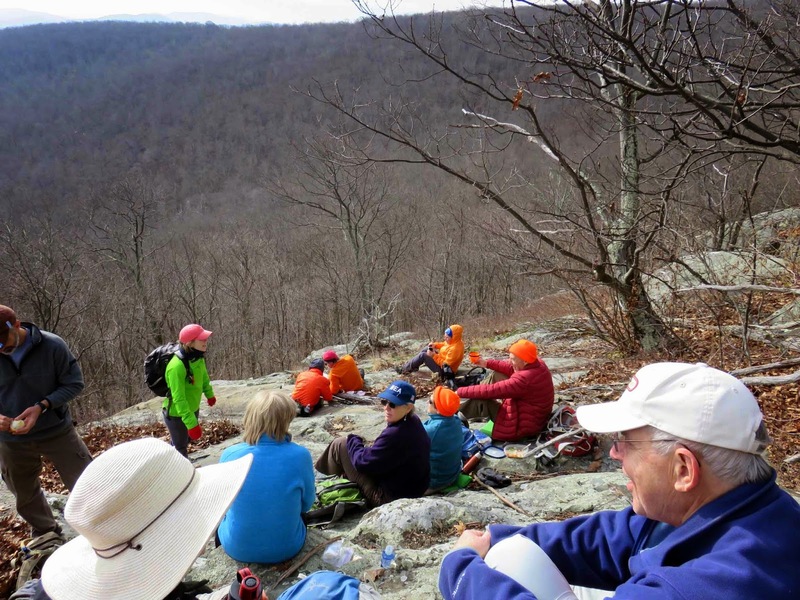 Lunch was at a semi-overlook high on a bluff over the James River, where the group watched trains, kayaks, hikers and automobiles from above. Everyone was amazed that they could lunch in tee shirts during late December. The group then descended to U.S. 501 where they crossed the James River on the original A.T. route, dating from its inception to the completion of the Foot Bridge. There wasn’t a lot of extra room on that bridge, so everyone waited until a couple of large trucks cleared the bridge before making their way across. 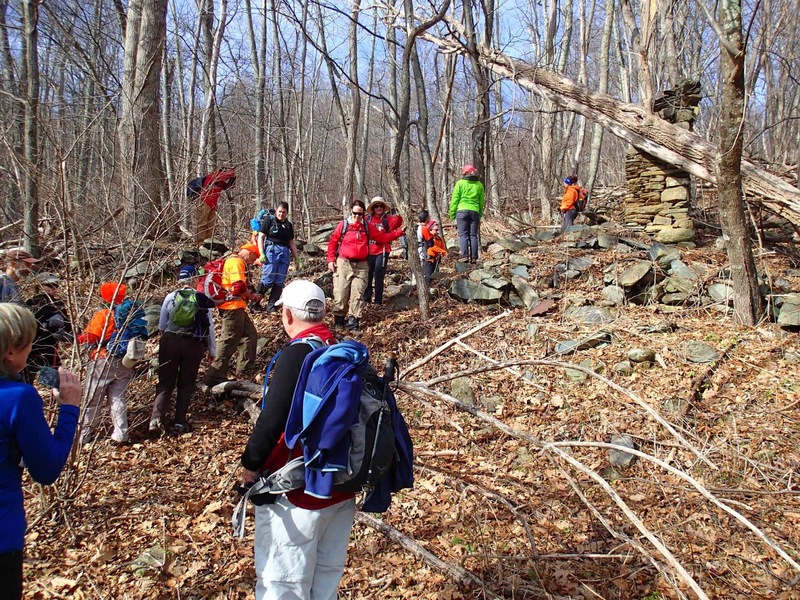 On the north side of the James River, the group cut back into the woods at Cashaw Creek and found the pre-2000 Appalachian Trail alignment, which followed a beautiful stream bed. This came out at a dirt forest road that the group hiked, though they later determined that the old A.T. must have continued past that road – it was not visible at the time. The road took them past a fire ring, complete with old couch, and then to the present A.T. 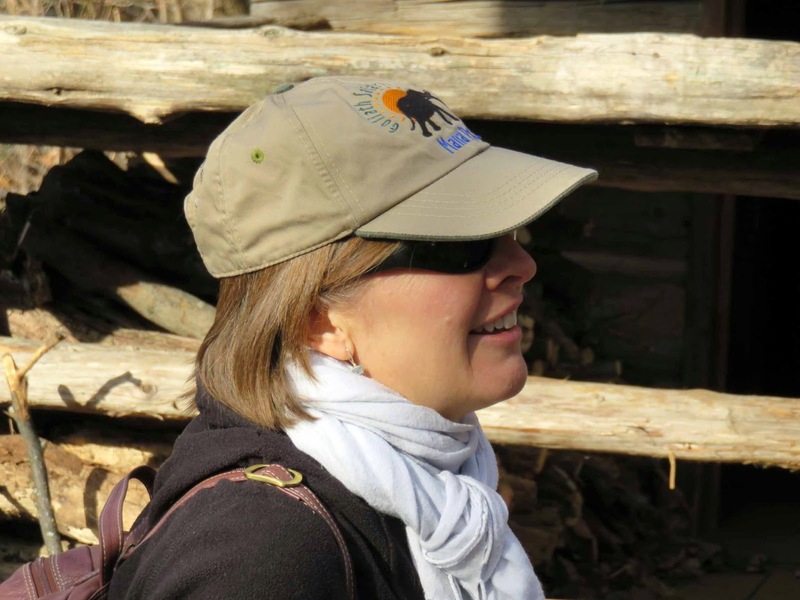 The group was amazed at how pretty the trail was on the new A.T., traveling through a small canyon along a scenic stream and crossing twice on Lincoln Log style wooden bridges while taking everyone back to their original parking area. 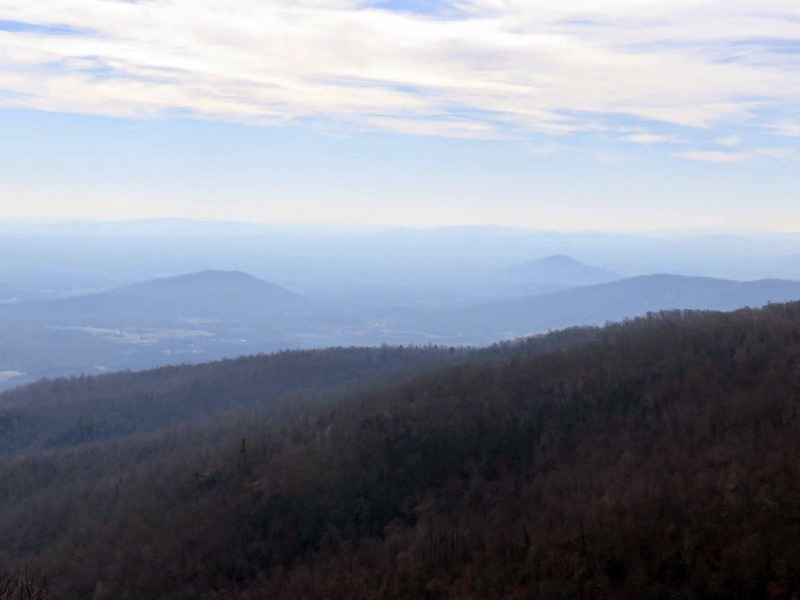 In all, the loop was 7.5 miles long, with elevation ranging between 650 and 1350 feet. 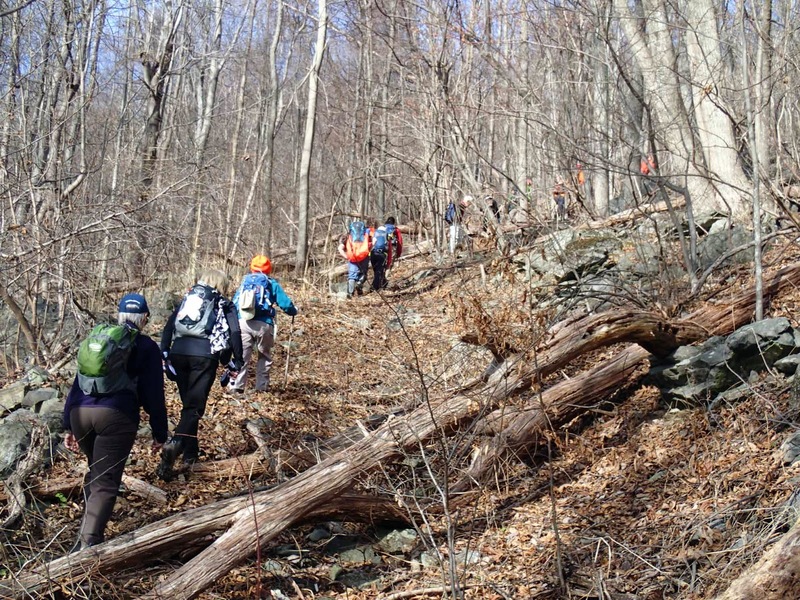 On a sunny, clear day 16 hikers followed Bill Holman and Mark Walkup from Johnson Cabin on the Vining Tract to the summit of Hightop Mountain, in a low impact bushwhack. CJ Woodburn, Iva Gillet and Bill had stayed at Conley cabin the night before to celebrate Geoff Manning-Smith’s 60th birthday. 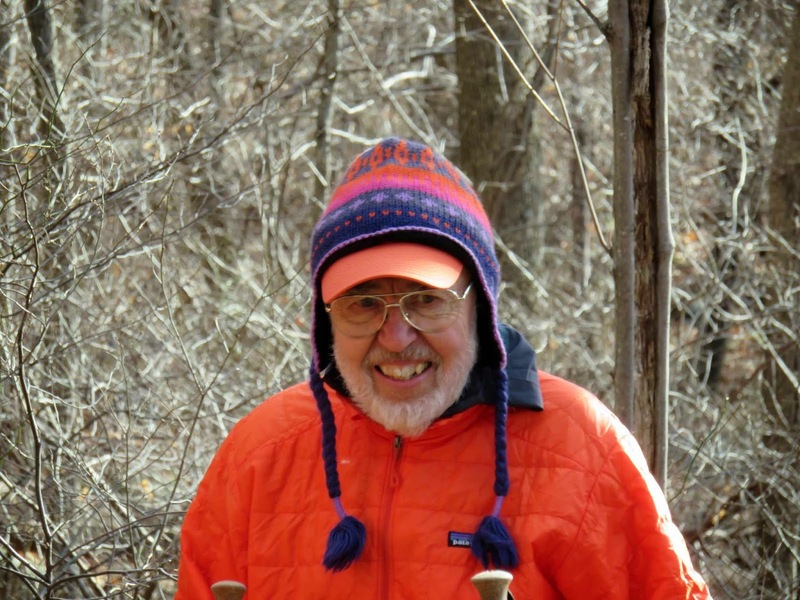 As a Vining Tract trail overseer, Geoff couldn’t imagine a better way to spend his birthday- trail work followed by a cozy cabin weekend with terrific food! 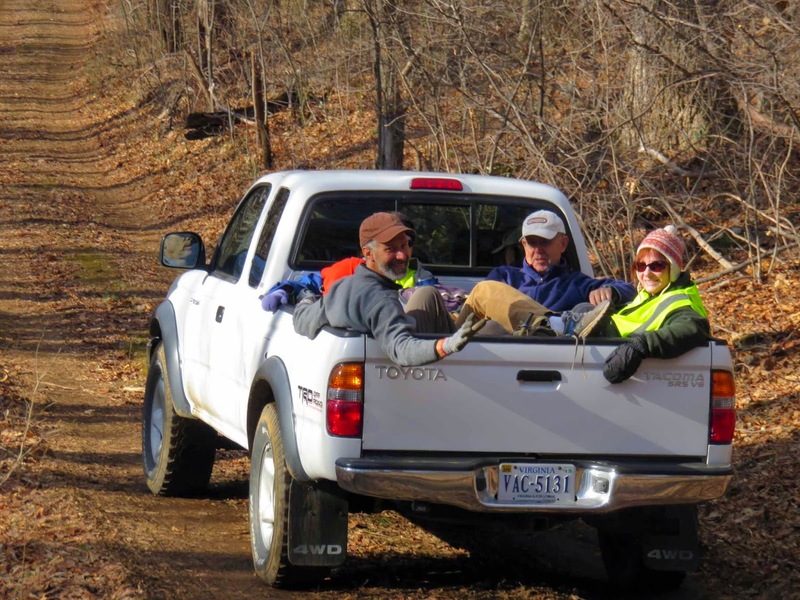 CJ, Bill and Iva were able to run the shuttle to Swift Run Gap in advance of Pete and Bev Fink arriving with the other hikers from Albemarle High School. 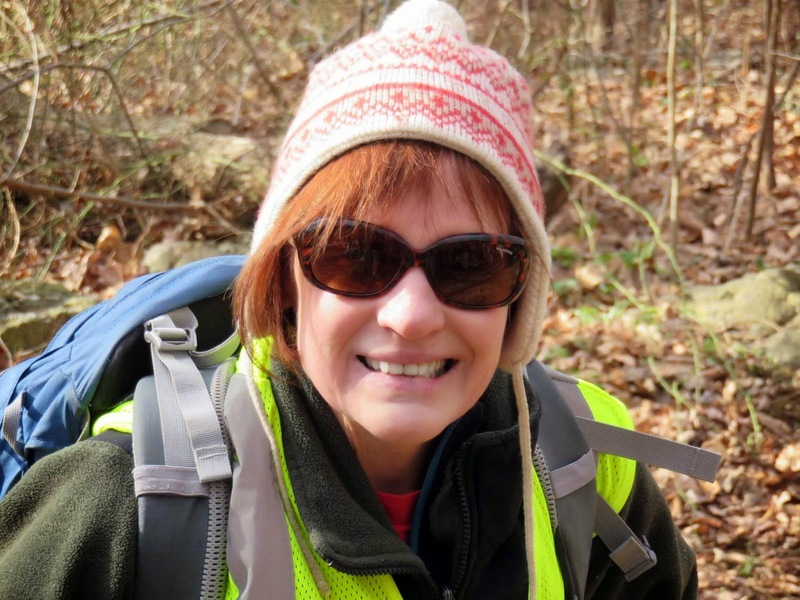 Joining from there was Jodi Frederickson, Dave Abdallah, Lindsay Brown, Clai Lange with new hiker Leslie McDonald, Marian Styles, Brian Muszynski. 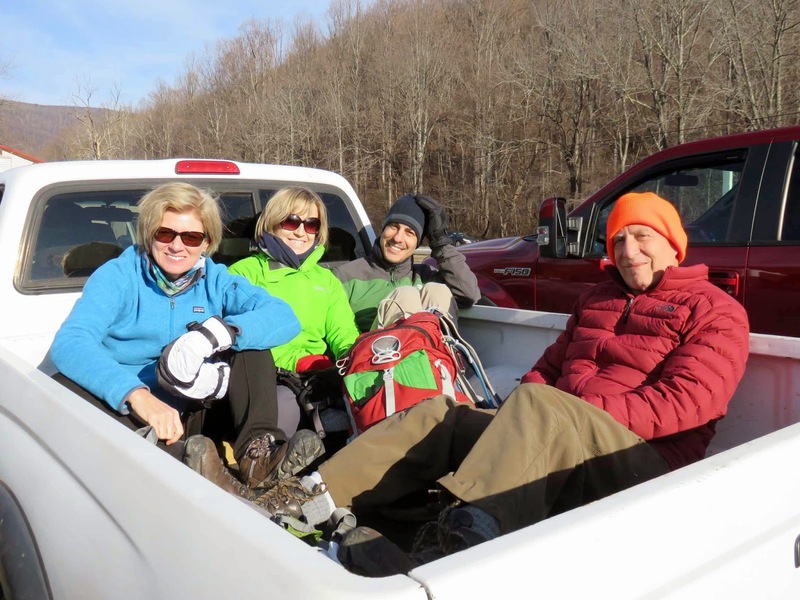 Ruth and Mark Walkup, being local Vining Tract overseers and Greene County residents, met us at the Blue Ridge Pottery, and Dan Ralston (also a Vining Tract trail overseer), Jeanne Densmore and Tom Miller met us at the trailhead. The ladies were happy to use the Johnson cabin privy- a well decorated and bright one- and then off we went with Mark Walkup at point and Bill as sweep. 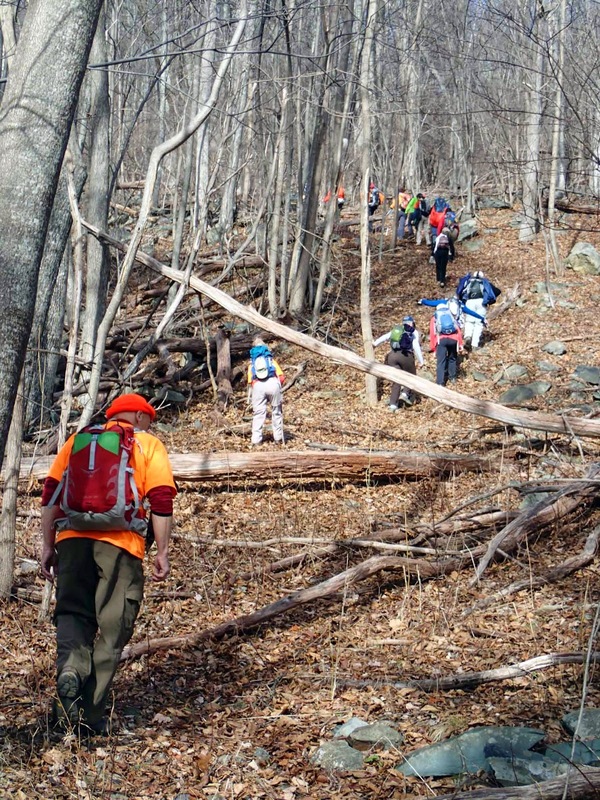 We were able to follow an old logging road for much of this hike, meaning that the going was much easier. While Mark charged ahead, with the most ambitious following closely, the group spread out, as we ascended the east side of Hightop. 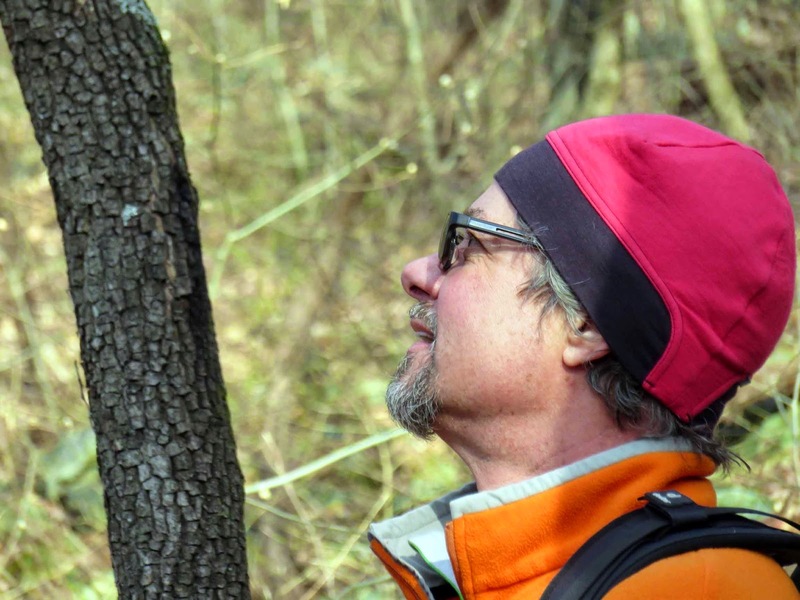 We reconvened from time to time, before reaching an old homesite for a snack. From here, we traveled along another logging road and reached the base of the cliffs. This is where the SNP part of the bushwhack starts, with several different routes available. Reaching the top of the cliffs for our lunch break, the view was lovely, looking into Mutton Hollow and far beyond. 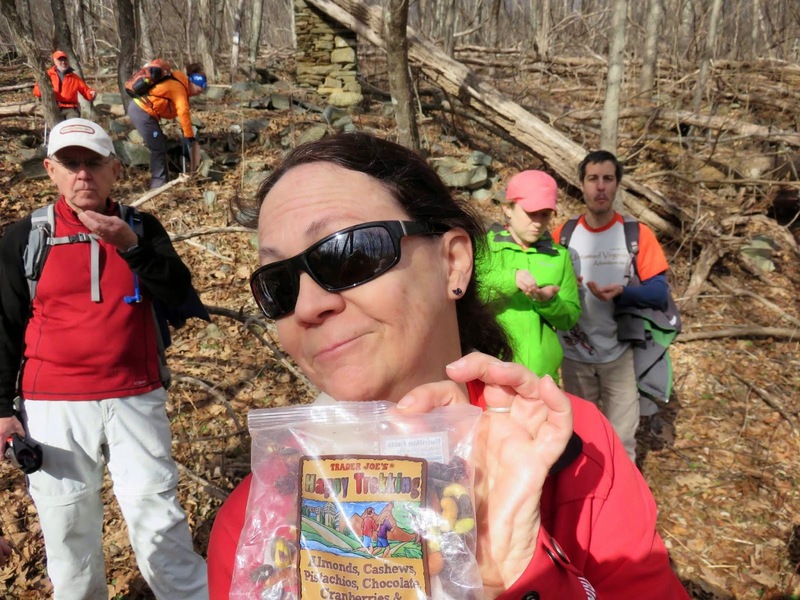 The new hikers enjoyed the PATC tradition of “treats” provided by the hiker leader- Mission Home pumpkin bread and mint cookies in the shape of stars. Dave disappeared for some time, checking out the rock climbing challenges of the cliffs that Jodi and he would like to enjoy. 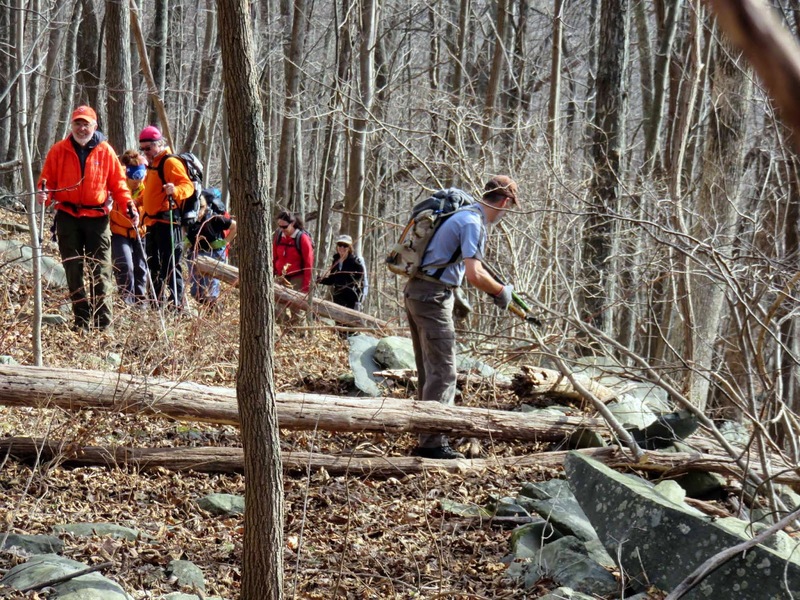 When we were replenished, we walked over relatively flat terrain to meet the AT just below the summit of Hightop. 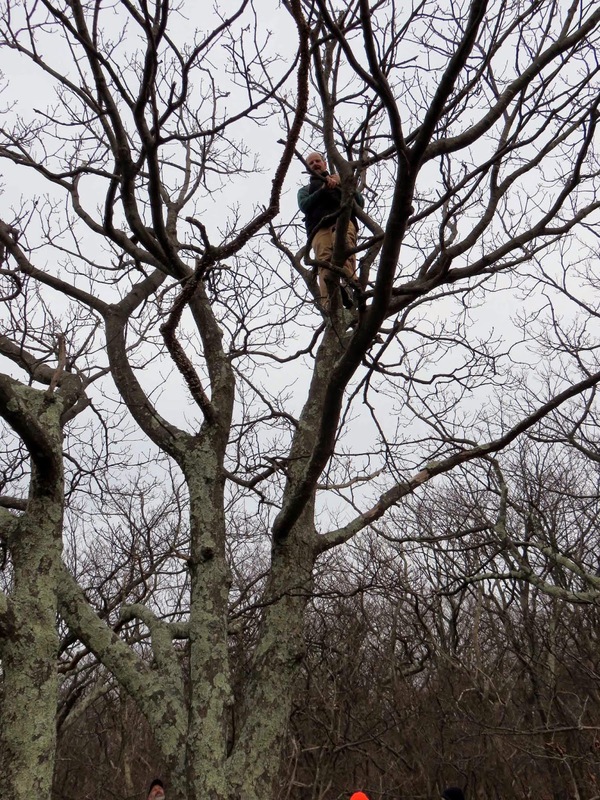 Mark led to several overlooks to the west, before Dan lead those interested to the tree covered Hightop summit, highest point in the southern SNP. 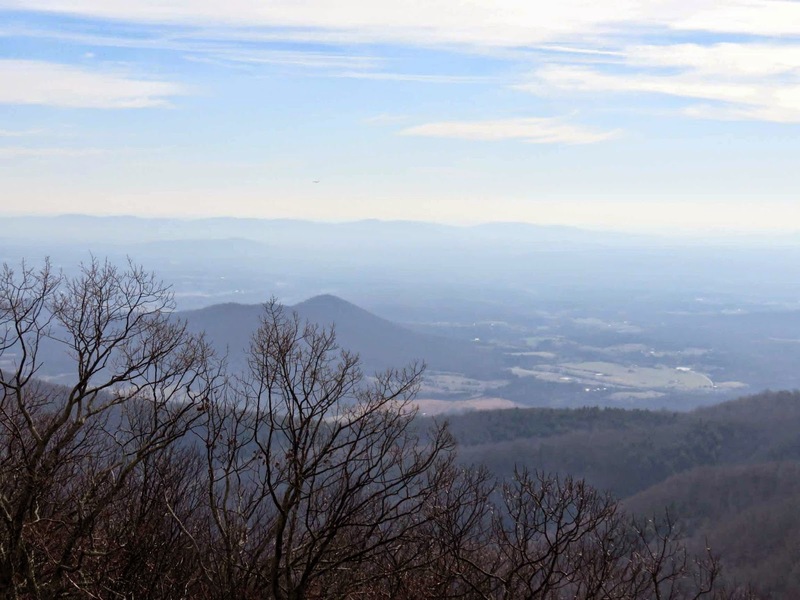 From here, we traveled north on the AT, crossed the Skyline Drive, and returned to our cars waiting at Swift Run Gap. We are able to creatively pile everyone into the cars for our descent to Lydia. 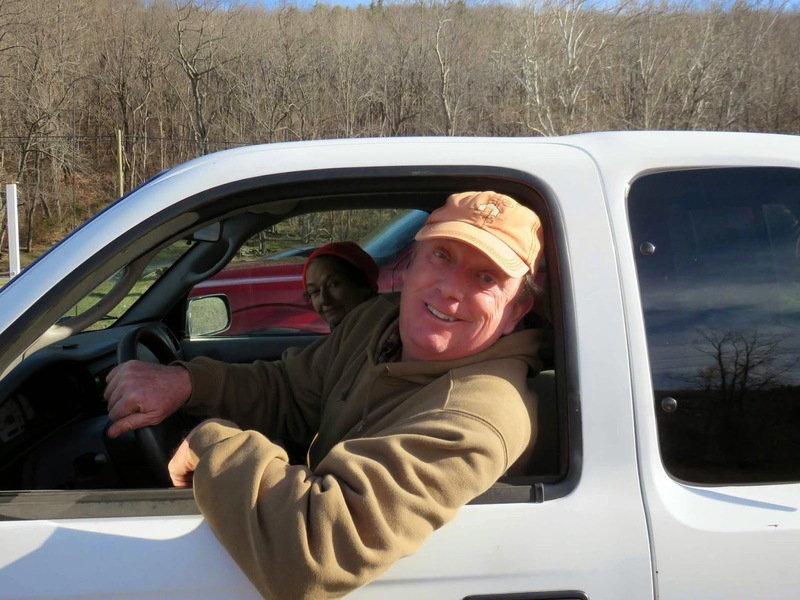 Dan then drove the shuttle drivers back to get the vehicles from Johnson cabin. All agreed that we enjoyed this unusual approach to Hightop and the camaraderie of hiking together on a lovely December day.